In a previous article, we outlined the standards for poly water tanks and installations. In this article, we will explain how these standards actually apply to your water tank and installation. Firstly, an important note: Many people think that Australian Standards for manufacturing are government legislated laws, but they are not. Australian Standards are formulated by Standards Australia, a private company. They only specify requirements that should be met by a manufacturer. This means the responsibility for verifying that a poly tank manufacturer is honest is ultimately up to you. The easiest and safest way that you can be assured that a product does comply with a stated standard is to ask for the name of the manufacturer’s independent certifying authority and certification number. 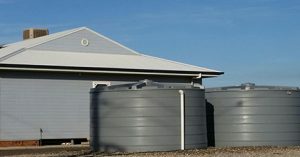 Poly rainwater tanks should be constructed of materials that are at least of a food-grade standard (compliant with AS 2070). Given other materials can be added to the raw polyethylene during the moulding process, you also want to ensure that the final tank product is still safe for storing drinking water (compliant with AS/NZS 4020). identification numbers – standards certification number and serial number should found near the top of your tank. Note: There are manufacturers who will promote and sell polyethylene water tanks that are not certified to AS4766:2006. Non-certified tanks are often cheaper since manufacturing expenses are reduced through not paying for certification and audits. Purchasing your tank from a ISO 90001 certified manufacturer means you can be ensured of a quality product produced by consistent, transparent and traceable manufacturing process. The pipes that your rainwater passes through should also be safe for drinking water (compliant with AS/NZS 4020). This does not generally apply to guttering or downpipes that deliver rainwater directly into the top of tanks because the contact with the rainwater is for a short time only. Nonetheless, pipework delivering water to the tank, between tanks or from tanks to houses should comply with AS/NZS 4020. Metallic tank fittings, connectors for use with pipes for the supply of water should comply with AS 3688 to ensure they do not react with your rainwater and leach contaminants into your water supply. Polyethylene pipes that are used in situations where the pipework is operating under pressure should comply with AS/NZS 4130. The materials used and design of the drainage from rainwater tanks overflow should be correctly installed (compliant with AS/NZS 3500). The last thing you want is your rainwater tank area being flooded which can affect the foundations of your tank and any nearby pump. If plumbing your rainwater into your home for use in areas like the toilet or laundry, a backflow prevention device must be installed to prevent your rainwater from contaminating the mains water supply (compliant with A/NZS 3500). Hopefully this has helped you to better understand Australian Standards and how they apply. Again, remember that the manufacturing standards are not laws only recommendations. Any manufacturer who claims they comply with a standard should be able to show proof of certification. If you have found this article helpful and are looking for a water tank, talk to our friendly staff today. Our expert team are happy to discuss your needs – simply call or email us.